A light, bright risotto with citrus notes that perfectly compliment fresh asparagus. You get refreshing, cozy, and nutritious all in one bowl. 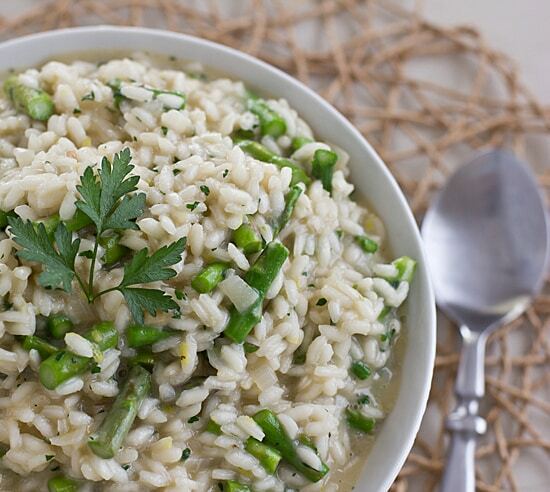 This creamy risotto is the perfect way to celebrate the spring asparagus season. Adapted from Epicurious’ Lemon Risotto. Bring broth to a boil in a medium saucepan and then reduce heat to low. Add 1 1/2 tablespoon of butter and oil to a large saucepan or Dutch oven over medium heat. Once butter has melted, add shallots and sauté until softened, about 6 minutes. Stir in rice; heat for 1 minute. Add wine and stir until absorbed, about 30 seconds. Now it’s time for the boring part! Add 1 1/2 cups of broth; simmer until absorbed, continuing to stir frequently. Add remaining broth 1/2 cup at a time as each 1/2 cup of broth is absorbed. (So add a half cup, stir, wait for it to be absorbed, add another half cup, etc. This will take about 35 minutes.) Add asparagus pieces with the last 1/2 cup of broth. Once all broth has been absorbed, add remaining butter, cheese, parsley, lemon juice and zest. Season with salt and pepper (you probably won’t need any salt if your broth has salt in it). If you can’t find thin asparagus, steam it before adding it to the risotto. This sounds so delicious – I’ve never tried risotto (I manage to bomb at brown rice making) but would be tempted if I could hang out and watch reality TV! 🙂 We had roasted asparagus the other night and it was delish! LOVE roasted asparagus! Risotto is a hassle to make because it requires constant attention, but it’s so worth it. Ha! I think I could eat a whole bunch of roasted asparagus too. That is my favorite way to make it! That looks absolutely and completely delicious! Ha! I am always blanking on words like that too. And hey, you could throw the spinach in this recipe and have spinach asparagus risotto! I cannot WAIT to make this as I am on a massive asparagus kick right now. Soooo, would this risotto thing give me permission to buy that robo stirrer thingy so I don’t have to stand over the pot b/c I think if it did, the Mr would actually make it just so he could watch it run. 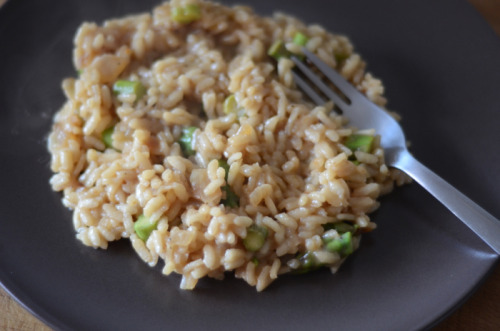 I love risotto – and asparagus, too! This is perfect – my neighbors will be harvesting their asparagus in the coming weeks so I’ll be making this once I get my delivery! My neighbors are in their 80s and they have THE BEST GARDEN EVER. They plant on a rotating basis so that they always have their favorites fresh. Genius. I want a garden like that! Once we get a fence, I totally want to do an edible backyard. And I’ve even sold my husband on the idea by reminding him that he won’t have to mow the lawn back there if we do it. I love the combination of asparagus with lemon too. I just bought my first bunch of asparagus last weekend, but its not local yet….hopefully I’ll be able to use it lots more before the season is over already! I think our asparagus season is nearing an end. It’s already getting hot here! Oh this looks so yummy!! I agree this combination sounds great. YUM! We love asparagus – have not seen it in a risotto. I will definitely try it since it is in season! You definitely need to try asparagus risotto! There are lots of different recipes for it–some are made with asparagus puree, others are made with steamed asparagus. So good! I’ve been waiting to get local asparagus before I go too crazy with it – should be ready soon! I already had risotto on my list of things to make with it – I’ll have to bookmark your recipe! Being further south, we’re a little bit ahead of you–I think we’re on the tail-end of asparagus season & now it’s time for strawberries! Asparagus and anything is wonderful. This recipe sounds so good. I love the lemon you have put in it to add the brightness and extra flavor. Very spring with the lemon and asparagus, and sounds so good! Once again, your photos are beautiful! I’ll have to try your recipe, it looks so yummy! Oh, yes please! This looks aaaah-mazing! I adore asparagus. I have to tell you that I am loving the new fresh look and the new name for your blog. It just fits you and your beautiful photographs so nicely! Made this in an instant pot, using rice/risotto directions. Added about 3/4 cup wine, otherwise exactly as you directed. Came out perfect.